It’s easy to get to­—and around—Worcester. WPI’s campus is 1.5 miles from the historic and beautifully restored Union Station, a major transportation hub offering bus, train, and commuter rail options. The city’s convenient location in central Massachusetts provides easy highway access to Boston, Providence, and Hartford (each under an hour away). Coming by air? Worcester Regional Airport is less than five miles from campus, and the area is within an easy drive of four major national and international airports. Once you arrive, you can get around using Worcester’s inter-city bus services, Zipcars, taxis, and several free college shuttle services that are available to the WPI community. Commuter Rail: The MBTA Commuter Rail at Union Station provides daily and affordable service between Worcester and Boston. Trains: Amtrak services the city of Worcester from Union Station to over 500 cities nationwide. Buses: The Worcester Transit Authority bus system extensively covers the city of Worcester, and the WPI campus lies along two separate routes. Both Peter Pan and Greyhound also offer inter-city bus service. Airports and Airport Shuttles: Worcester Regional Airport serves JetBlue Airlines, and the city is also within an easy drive of Logan International Airport, T. F. Green Airport (Providence, R.I.), Bradley International Airport (Hartford, Conn.), and Manchester (N.H.) Airport. Several local limousine companies also offer transportation to and from area airports and often have special WPI rates. Zipcar: This rental car system provides a transportation alternative––and there are even pick-up and drop-off locations on the WPI campus, including the Park Avenue Garage and Gateway Park. Learn more. Taxi Services: Two taxi services provide transportation in the Worcester area: Yellow Cab (508-754-3211) and Red Cab (508-792-9999 or 508-756-9000). College Shuttle Services: The CityRide shuttle (PDF) makes it easy for the WPI community to explore the city, while WPI's campus transportation provides safe access to (and around) the campus and surrounding areas. Driver’s Licenses: If you need to get a Massachusetts driver’s license, contact the Registry of Motor Vehicles located at 611 Main Street in Worcester. Need a place to stay overnight? Visit the Massachusetts Office of Travel & Tourism for a list of area hotel and lodging options. 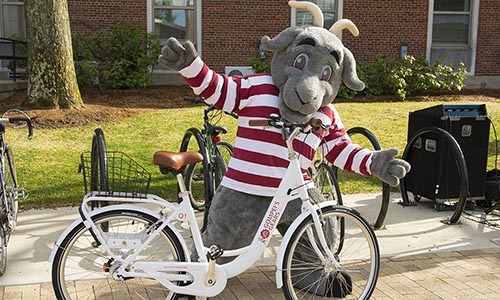 This program, originally conceived as a student project, gives WPI students, as well as faculty and staff, access to a bicycle from convenient locations on campus.